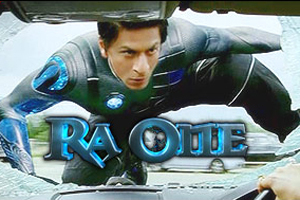 Shah Rukh Khan’s latest bollywood extravaganza Ra.One has caught the imagination of not only his fans but also the whole industry. Ra. One is not only Shah Rukh Khan’s but also Bollywood’s most ambitious project till date. According to the grapevine, with only 6 days to go before its release the sci-fi superhero movie is still not complete. While Shahrukh Khan has been doing extensive travelling in order to promote his movie, the director of his movie Anubhav Sinha is spending sleepless nights at the studio in order to make sure the final touches to the movie are shaping up well. The film’s technicians and post production teams are working round the clock 24/7 in order to get the movie completed before its Diwali release. Post production work on a sci-fi project of this magnitude that is heavily backed by visual effects and graphics is hectic and time consuming. Producer Shahrukh Khan who himself is having sleepless nights promoting ‘Ra.One’ is checking on the progress regularly. Anubhav Sinha explains why the delay has happened. The director admits that his personal inhibitions have been responsible for stalling the film plus the movie is releasing in five versions – Hindi, Tamil, Telugu, English subtitled and 3D. So it’s five times the work.